My dad and Husband. They are the masters of puns and dancing. I'm not familiar with pun dancing but it sounds incredibly entertaining. I'm smelling new reality TV show. I drink a Pepsi, crack my fingers and type whatever comes to mind. Oh yeah. I can’t wait to tell my brother. He said I would never be as funny as our dad. I don’t see my dad with the title of HumorQ Champion. Don’t worry, I rubbed it in my dad’s face. And my husband’s. Well that would explain the funny smell....I would ask if this was the new entryway to Narnia. There's that GEICO commercial now I think with the woodchucks actually chucking wood, so we're closer to the answer with them being caught on film but there's probably no end to it really. It's like asking how much jibberish could I type. 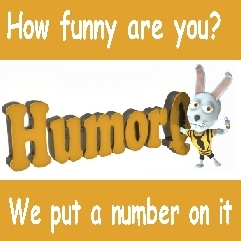 Is there another website (besides HumorQ.com where we put a number oh how funny people are), that you would like the world to know about? Well there’s a site called reddit, and it has a bunch of subreddits such as Funny, Jokes, Humor. You can submit stuff and get karma. Don’t try to hard. If you can’t think of a caption just walk away. Or close the tab. Personally I think trying too hard is exactly what you should do, and never close the tab. Just short of cranial explosion is when I would give up....but that's just me. In what appears to be a complete breakdown of caption security a HumorQ.com member has claimed to have left a bar in Austin Texas while failing to retain the cartoon caption prototype he had been working on for the latest contest. The HumorQ member wished to remain anonymous but had this to say. "I had the cartoon in my head all day. There were some mediocre captions that came to my head, but we're talking humorq scores of 110, 120 at the most. Then, right as I'm finishing my first Mexican martini, it came to me. I jotted it down on my napkin. And then I guess I just left it there like a suitcase that should have been handcuffed to my wrist. I'm just beside myself. Not in a there's me, and there's another me right here kind of way. I mean I'm upset. The caption had something about an anchor and a three dollar calculator, but that's all I remember. I know it was at least a humorq of 180, and now it's gone." Skeptics believe this could be an intentional copycat leak to try and stir excitement about the caption contest at http://humorq.com . Whatever.